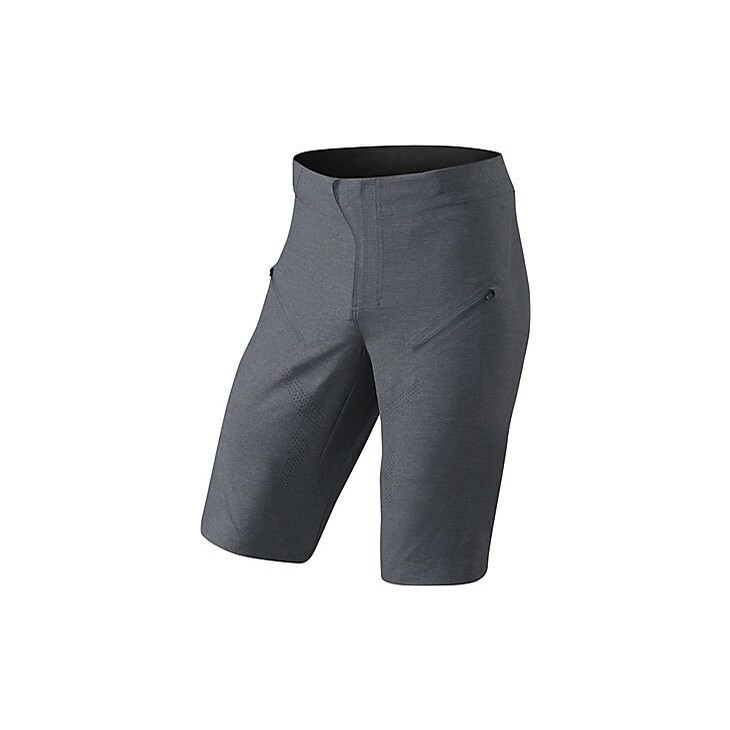 Filling the gap between bib shorts and baggies, the goal of our Atlas Pro Shorts was simple—develop a minimal and clean design that's super light, breathable, and durable out on the trail. With these features in mind, we went with a new lightweight VaporRize™ stretch woven fabric that moves and flexes with you at every ascent, descent, berm, and drop. To complement this new fabric, we included strategically placed laser perforations that allow for cool air to flow through hot zones. A perfect fit, meanwhile, is achieved through a center-back waist adjustment tabs that keep the outside waistband clean, and it's non-obtrusive to packs or jersey fabric that can catch on exposed Velcro®. This hidden elastic adjustment system ensures that the fit of the shorts can be set to your preference up front without needing to readjust mid-ride. For the fly, lightweight plastic snaps work in conjunction with a plastic coil-fly zipper to keep them comfy while riding in and out of the saddle. And lastly, we included two bonded zippered pockets that are conveniently located to easily reach your trail essentials. Center back waist adjustment tabs keep the outside waistband clean and non-obtrusive to packs or jersey fabric that can catch on exposed Velcro®. This hidden elasticated adjustment system ensures that the fit of the shorts can be set to your preference upfront without needing to readjust mid-ride. Roomy housing for the adjustment system acts as additional secure storage when not wearing a pack. Lightweight bonded plastic snaps work in conjunction with a lightweight plastic coil fly zipper to keep the center-front light and comfortable while riding in-and-out of the saddle.